I firmly believe the “common wisdom” that most machines are not designed to last as long as in the past. Our Korean-made refrigerator, company name rhymes with Ram Dung, has basically died in less than five years. Two of our TV sets, made by the same company, have been in need of being replaced for years, but we just haven’t purchased new ones. The first washing machine (don’t remember what company “built” that) we bought when we moved into our current house gave up the ghost after five years. Ironically, automobiles seem to be an exception to that rule. According to Ratchet+Wrench the average age of a “light vehicle” in the US is about 12 years. Wish I could give you more info, but that site has a paywall. An inflection point in the average age occurred during the “Great Recession” but as the economy has recovered the trend hasn’t really reversed. Of course, part of the explanation is that people are simply not buying cars as often as they did previously and doing whatever maintenance is necessary to keep their current car running. The cars are probably more reliable, but people’s automobile buying habits have changed as well. As for Frugal Friday, my initial idea for this week was simply to piggyback on this article by Hagerty about 10 “contemporary classics” under $45,000 that will soon appreciate rapidly. Upon further reflection I felt the article was too speculative to be useful and that $45,000 wasn’t frugal under almost any circumstances. From canacopegdl.com a picture of a 2006 Avanti. This one is not for sale, as far as I know, but I just wanted to show it in the context of being a contender for Ultimate Garage 2.0. From this Autotrader listing a picture of a 1967 Cadillac Eldorado. The mileage is shown at just 41,443; the list price is $9,900. One might have to put that much or more into a good paint job as the paint looks every bit of 50+ years old. As I have written ad nauseam I am a big fan of these cars. I am enamored with the technology, the luxury, the power and the looks. This iteration of the Eldorado used the same front-wheel drive platform introduced in the 1966 Oldsmobile Toronado, which was the first real front-wheel drive car produced in the US since the Cord 810/812 of 1936-37. I wouldn’t have to have a ’67 in Ultimate Garage 2.0, a ’68 would be acceptable. Maybe that’s how I would list it, as a 1967-68 Eldorado. I would want a car with hidden headlights. However, the engine was changed between those two model years. 1967 was the last year for the 429 cubic-inch engine rated at 340 HP/480 LB-FT of torque. For 1968 the engine was enlarged to 472 cubic inches with output of 375 HP/525 LB-FT. The 1968 engine was designed to meet the new government emissions standards that took effect that year. Two contenders for my Ultimate Garage 2.0 could each be purchased for less than $15,000. I don’t really have champagne and caviar tastes. This is Robert Riger’s famous photo of all-time Packers great and Pro Football Hall-of-Famer Forrest Gregg. He passed away about two weeks ago and I was remiss not to mention it then. (Yes, tonight is the first round of the 2019 NFL Draft.) This picture was taken on December 11, 1960 in San Francisco; the Packers defeated the 49ers 13-0 on their way to a Western Conference title and their first appearance in the NFL Championship Game since 1944. From smclassiccars.com a picture of a 1956 Chrysler 300-B. This was the second of 11 “letter cars” by Chrysler, which began in 1955 with the C-300. The 1956 model was significant as it was the first American car to be offered with an engine that produced at least one HP per cubic inch. While the standard 354 cubic-inch Hemi had 340 HP, an optional one with higher compression produced 355 HP. Sorry, Corvette fans, the 1957 fuelie was not the first American one HP per cubic inch engine. As everyone knows I am a big Corvette fan (I’m on my third), but I am a bigger fan of the truth. The letter series cars were never produced in high numbers. For 1956 production was only 1,102. New for 1956 was a record player, the Highway Hi-Fi. I kid you not, a record player in an automobile. Transmission options were a 3-speed manual or 2-speed automatic. Currently on Hemmings one 300-B is offered for sale with photos included (NEVER buy a car from an ad without good photos). The dealer is asking $139,900, not exactly a candidate for Frugal Friday. That price also seems out of whack. In the last four years two 300-Bs have sold at Mecum auctions in the mid-$30,000 range. Of course, if the Hemmings car has a 355-HP engine (doesn’t say in the ad), then it’s worth more than one with a 340-HP motor. At least one of the Mecum cars was 340-horse. These are important cars and I am glad to write about them even if I am not a huge Mopar fan. Is the 300-B (or any letter car) in the Ultimate Garage of anyone reading? Please let us know. Between my wonderful wife’s 2015 Corvette and my 2016 Z06 Corvette the combined HP in the garage is a tad over 1,100. The first Corvette, the 1953 model, had an engine rated at 150 HP (and 223 LB-FT of torque, our two cars have a combined torque rating of over 1,100 LB-FT). The year the Corvette was introduced the highest HP engine from an American automaker was 210 from Cadillac. Lincoln was the only other make that offered 200 HP (205). Of course, Cadillac and Lincoln were/are luxury makes and their cars from the early 1950s needed HP and torque so they could move at all. Much to my disappointment I have been unable to unearth a timeline, or evolution, of HP in American cars, granting that my search was limited to 10-ish minutes on the Internet. One of my go-to books, Encyclopedia of American Cars by the Auto Editors of Consumer Guide®, only has detailed information since 1930. The very rare, just 13 made, Duesenberg Model X may have been the first American car to offer 100 HP. The Model X was built in 1926-27. If anyone has any solid information on this topic I would very much appreciate your sharing that with us. To 48-volt or not to 48-volt? Or to take arms against a sea of troubles…wait a minute, I got confused. Once again, I am not sorry I purchased a used C7 Z06 last month. Actually, I’m even happier now because I have the last generation of front-engined Corvette that will ever be made. I am also happy, though, that the C8 is real and that we will see it soon. If anyone knows the answer as to whether the C8 has a 48-volt electrical system please let us know. Thanks. I am sad today as my wonderful wife is leaving town on a business trip. Each successive trip makes me more sad and I am especially worried because her drive today will be quite long. Be careful, V Squared! I LOVE YOU!!! So far, one vote has been cast for 5-7 cars for (my) Ultimate Garage 2.0, one for 8-10 cars and one for how ever many my budget and criteria will generate. I don’t really have a budget because this is supposed to be an “Ultimate” Garage, but growing up in the lower middle class part of the socio-economic spectrum I don’t have an out-sized desire for expensive cars. Even though Frugal Friday wasn’t my idea, it fits me well. Ultimate Garage 2.0, like the first one, will be idiosyncratic like I am. 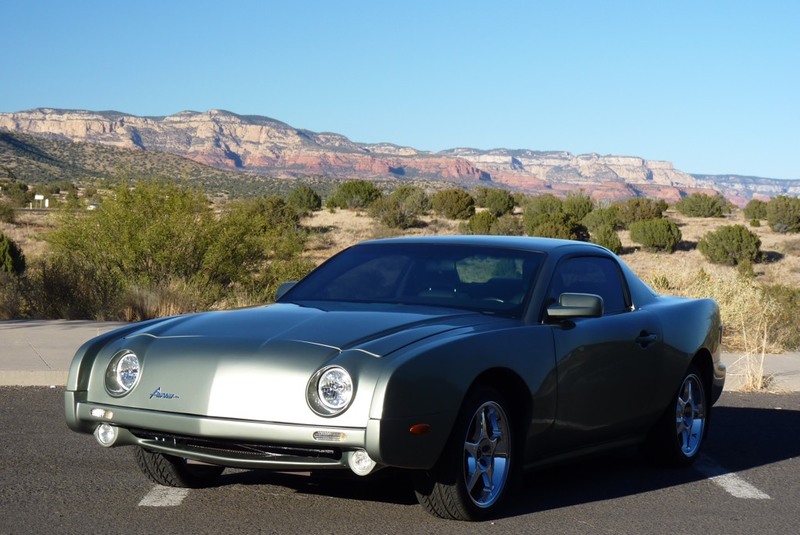 It won’t have any Mustangs or a 1970 LS6 Chevelle, but it might have a Studebaker Gran Turismo Hawk. Let me add that I don’t think I am a knee-jerk contrarian. I don’t think I automatically reject things that are popular or mainstream. I have known people like that and, as my armchair psychologist alter ego must postulate, I believe that many people who engage in such behavior are doing so because they think that will make them smarter than others or better than others. I think that they fail at those goals because being a knee-jerk contrarian is really no more profound or insightful than being a knee-jerk conformist. I strongly believe that almost any cognitive behavioral pattern constrained by rote is very seldom optimal. From silodrome.com a picture of a Ferrari 365 GTB “Daytona.” I mean, Wow! Of course this was another Pininfarina-designed car. I mean, Wow! I remember an episode of the “original” Top Gear where Richard Hammond and James May race each other along the Italian Riviera, Hammond in a Ferrari 365 GTB and May as a passenger in a speedboat. Although May “won” the race in terms of arriving at his destination first, Hammond really won because he so enjoyed the drive while May was abused by the rough ride of the speedboat. Do you really care about the specs and production figures? OK…about 1,400 of these were made in total from 1968 to 1973. This car replaced the 275 GTB/4 in the Ferrari lineup. The 365 GTB was powered by a 4.4 liter/268 cubic-inch V-12, really a small displacement for 12 cylinders, that generated 347 HP/318 LB-FT of torque. The car had a 5-speed manual transmission. One of the possible constraints for my Ultimate Garage 2.0 is my long period without having driven a vehicle with a manual transmission, 40+ years. I don’t know that if I really had the opportunity and the means to indulge my automotive fantasies whether I would acquire cars that would take some effort to learn to drive. Of course, if I exclude manuals then no Ferrari 365 GTB Daytona and no Honda S2000. On the other hand, if my Ultimate Garage ends up at 20 cars then it would really be just an exercise in excess. I’m still hoping to read some of your Ultimate Garages! Please feel free to send them to me and to comment, in general. I don’t expect a lot of people to read the blog today for obvious reasons. From History of the American Auto by the Auto Editors of Consumer Guide®, the version published in 2004, a picture of a beautiful 1948 Cadillac Series 62 convertible. Of course, the 1949 model is more significant historically in some ways, but on that particular day this picture just took my breath away. The feeling of joy that overwhelmed me as I posted this photo and wrote about this car is hard to describe. That’s when I decided I would blog regularly and write about cars. I suffered a setback when the Evil Empire (make no mistake, Google is evil) deleted my blog in January, 2018, but I started this blog on WordPress the day the other blog was deleted and have continued to write almost every day. Blogging is cheaper than therapy and almost as effective. If you celebrate this day, then have a happy one. Even if you don’t celebrate this day, I hope you have a happy day. When you read one or two posts on Disaffected Musings that could be considered a sojourn, which is a temporary stay. Each post should take about 3-7 minutes to read. A day consists of 1,440 minutes. I’m not asking for a big chunk of your day. Person: Do you like country music? Me: No (in a very flat, non-confrontational tone). Person: But you like Waylon Jennings, right? The person turned around and walked away. I’m sorry, but how clueless must a person be to assume that everyone shares an affinity for a particular musician. Once again, a person assumed that their opinion was absolute truth. Why are so many people like that? OK, still can’t seem to get a poll to work here through PollDaddy. What I want to know from you is how many cars should be in my Ultimate Garage? I am still hoping that more of you will submit yours. I mean this is still basically a car blog and what’s better for a car blog than for people to write about their dream cars. Dream cars, you say? From honestjohn.co.uk a picture of a Jaguar F-Type convertible. At this point I no longer remember if I included one of these in my original Ultimate Garage for the blog hosted by the Evil Empire. Of course, I can no longer access that blog. WordPress allows a blogger to download their blog; I don’t recall a similar feature from Blogger/Google. As I have written before I have somewhat of a heretical view in that I prefer the looks of the F-Type to those of the E-Type. Don’t get me wrong: I think the E-Type is gorgeous. 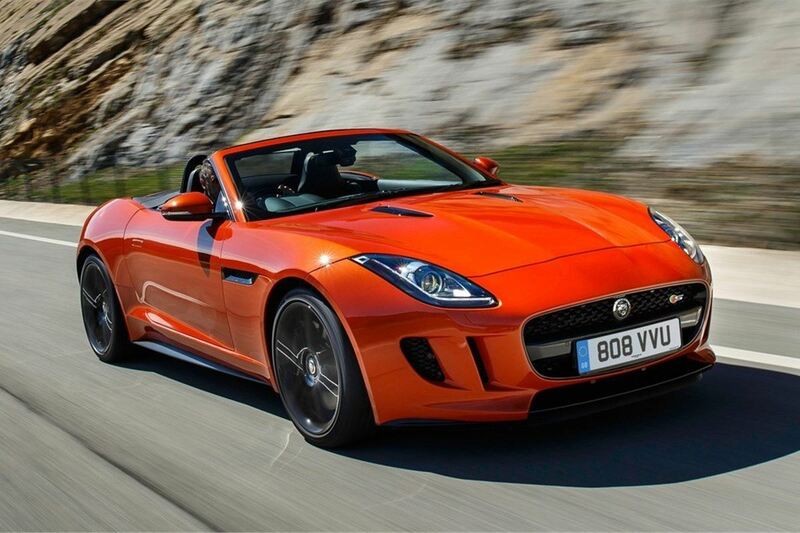 It’s just that on most days I prefer the F-Type. What sayeth thee? Hope you have enjoyed today’s sojourn at Disaffected Musings. Please come back and bring some friends. Of course, the first quote can be attributed to Shakespeare while a version of the second has been attributed to Daniel Patrick Moynihan. I don’t know about you, but I am not a big fan of people who pontificate without command of the facts. Freedom of speech doesn’t mean anyone has to listen and to paraphrase Asimov one more time, democracy does not mean that Person A’s ignorance equals Person B’s knowledge. Of course, I would add the caveat that lack of credentials doesn’t necessarily mean lack of knowledge. A real-world example: I commented on an article about the C8 Corvette on an automotive website. (Imagine that…) Part of my comment was anticipating the groan from the manual transmission snobs who would bemoan lack of same in the new Corvette, at least at first. Someone replied that Chevrolet was restricting its market because most Corvette drivers drove a manual transmission. This person was obviously unaware that the majority of Corvettes have been sold with an automatic transmission every model year since 1972! I stated that fact in a reply of my own. What I didn’t state (sorry for gilding the lily) is that more automatic transmission Corvettes were sold in the ten model years 2007-2016, inclusive, then the total of all Corvettes sold from 1953 to 1965. Remember, too, that Corvette sales were seriously affected by the “Great Recession.” Corvette sales declined by 71% between model years 2007 and 2012. You know, it’s really not that difficult to look stuff up these days. If you find two or three “reliable” sources that agree you can have some confidence in whatever fact(s) you found. Also, loud and wrong is still wrong. From this Hemmings listing a picture of a 1963 Chevrolet Corvair Monza Spyder convertible. OK, what’s “pioneer-ish” about this car? It has a turbocharged engine. In 1962, Chevrolet and Oldsmobile (another first for them) introduced the first mass-produced turbocharged cars anywhere in the world. The turbo system was not sophisticated at all compared to today, but GM deserves kudos for basically seeing the future. Turbocharged cars are now common. A turbo engine was available in the Corvair from 1962 through 1966; the Olds Jetfire was only available in 1962 and 1963. This particular Corvair is being advertised at $10,000. On Hemmings I searched for Corvair turbo cars from 1962 or 1963. If I limited my search just to the debut year I might not have found anything. I think being able to buy a turbo Corvair for about ten grand is a very frugal way to buy a pioneering car. By the way, Chevrolet produced about 19,000 Monza Spyders in 1963 of which approximately 7,500 were convertibles. This was the first model year for the Toronado, which was the first mass-produced front-wheel drive American car since the Cord 810/812 of 1936-37. Once again, Oldsmobile and General Motors were ahead of the eventual trend toward FWD cars. Olds produced almost 41,000 Toronados in its debut year. The seller is asking $9,595 for this example. Another Toronado, a ’67 model, was actually advertised at a lower price, but didn’t look good in the photos. This example isn’t pristine, either, but for less than ten grand that wouldn’t be a big deal to me. “Households headed by a ‘conservative’ give, on average, 30 percent more dollars to charity than households headed by a ‘liberal.’ This discrepancy is not an artifact of income differences.” I can’t stand when people give off the “do as I say not as I do” attitude. Charity and philanthropy are great; coercion is not. – In the 17 seasons that Unitas was the starting quarterback for the Baltimore Colts they had the best record of any team in the NFL. OK, Hill didn’t start for the Chicago Cardinals in 1958, but he did play for them that year. Bart Starr started half of the Packers’ games in 1959 (6), but less than half in 1958 (4). The difference between Unitas and the rest of the league is just astounding. More from the book: …many people will say that Johnny Unitas’ place in football history can’t be measured with number tables and a few bullet points. Hey, I grew up in Baltimore and Unitas is my favorite football player of all time and always will be. I am very aware of his special place in history. But his numbers and accomplishments, even listed in cold black and white, are quite impressive. I salute you, Johnny Unitas! The 1959 Corvette did not have the louvered hood or trunk spears that were on the ’58 model, much for the better in my opinion. Corvette production for 1959 was 9,670; the first year with 10,000+ was 1960. Only 7.7% of the ’59 cars had the highest output engine, the 290 HP fuel-injected motor (RPO 579D). 56.7% of the cars were built with the base 230 HP engine; the only displacement available for 1959 was the 283 cubic-inch V-8. Imagine that sixty years later, and despite the denuding of all US car engines in the 1970s, Corvettes were available with 650 HP and 755 HP. Of course, the Corvette has long been a symbol of athletic excellence in the US. 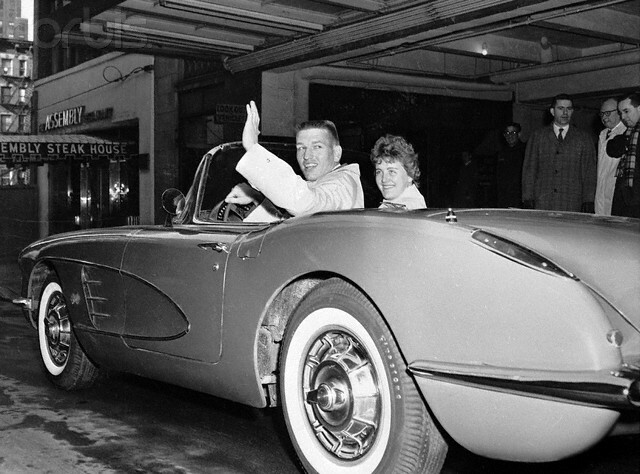 The great Sandy Koufax was given a new Vette by Sports Illustrated after his performance in the 1965 World Series. When Joe Flacco was named MVP of Super Bowl 47 (once again, I think the roman numeral thing is dumb) he was given a new Corvette.